The big supermarkets haven't done enough to respond to customers, according to Tesco's feted former boss. Tesco and the rest of the ‘big four’ supermarkets (Asda, Sainsbury’s Morrisons) are certainly in a pickle, squeezed from the bottom by the discounters Aldi and Lidl and the top by Waitrose. But according to former Tesco boss Sir Terry Leahy middle-of-the-road retailers can still win big - if they respond to customers. ‘If you’re strong from the middle it’s the best place to be in market, because you can actually reach from your position of strength the whole of the market in a way that focused niche players never can,’ Leahy told the Evening Standard’s Business Connections event on Tuesday night. Leahy, who stepped down from Tesco in 2011, was unsurprisingly cagey when MT asked him how much of Tesco’s current woes were down to his ill-fated US Fresh & Easy venture. It was unveiled to much fanfare in 2007 and exited by now ex-boss Philip Clarke in 2013 at a cost of £1bn. Tesco, then, according to Leahy, needs to think big to get out of its rut (well at least the £263m profit black hole anyway). 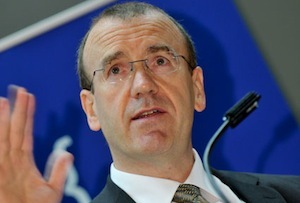 MT wonders if new boss Dave Lewis is listening.